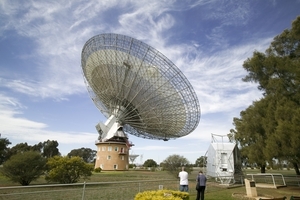 About 100 000 people visit the Parkes Observatory each year to see the telescope, which has operated since 1961. The structure in the bottom right of the image is the focus cabin, which housed the sensitive radio receivers at the telescopes focus above the dish surface until it was replaced by a much larger focus cabin in 1996. The Parkes telescope is the largest fully steerable dish radio telescope dedicated to radio astronomy in the southern hemisphere and fourth largest in the world. Astronomers from around the world use the telescope to measure naturally produced radio energy from space. On occasions it has been used to receive signals from space craft such as the Apollo 11 moon landing.